Our Day Trip from Datong with CITS. We went to Datong in an effort to see the Yungang Caves and the Hanging Monastery. Datong was an ancient capital of the country and former seat of power. As we got off the train, we went searching for CITS (the Government run tourist agency) as they were recommended for a tour and potential train tickets going forward. Instead the CITS man came to us, whisking us away like the scary touts we usually avoid and signing us up for a tour the next day. The Yungang Caves contain over 50,000 Buddhist statues that cover an area over a kilometer long. 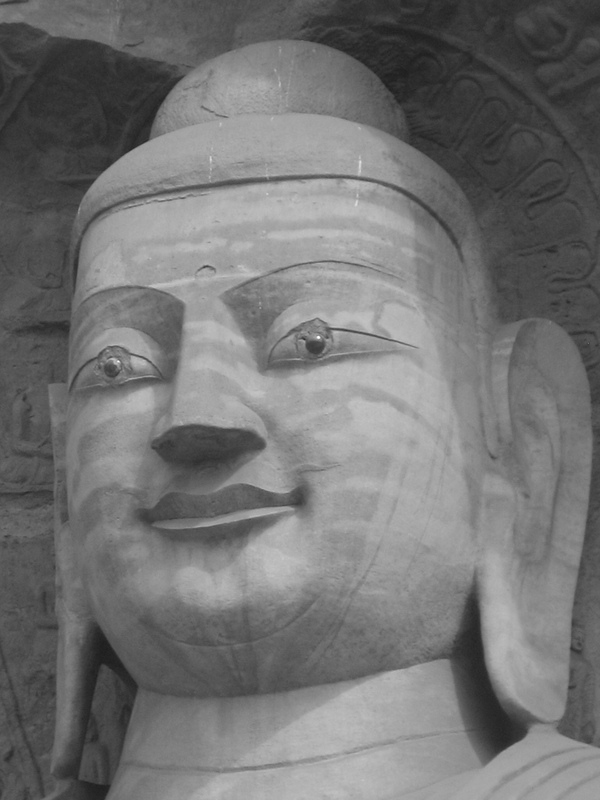 The most impressive of them though are the larger Buddhas, the greatest of which measured in at over 18 meters (over 54 ft). Also of note was how the caves were carved; they were developed from the top down. As a result a few of the caves go a little lower than ground level but the accuracy in which these caves were developed is certainly breathtaking. The caves ranked right up there as one of the most impressive cultural sights we've seen in Asia. From there the tour headed to the Hanging Monastery. The Monastery is over 1400 years old and is just up on the side of a cliff in a now dammed valley. The rooms were all built to the contours of the cliff face. The real prize though is the insides of the rooms; intricately carved statues of old religious figures, including the Three Religions Hall where Buddha, Laotzu and Confucius all sit side by side. Of course with it being China, this sign was a requirement as well. The CITS tour ended up being very good. Our tour guide had good English, showed us the sights and was willing to go into surprising depth answering our questions. It was also a relatively inexpensive way to see both the Yungang Caves and the Hanging Monastery and meet five other great people (two Canucks, two Aussies and a Japanese woman) that we were able to swap stories with from stop to stop. Offsetting the cool things to see in Datong however was the ungodly pollution. Datong is coal country which was evident in every attempted breath. (The caves are actually across the highway from a coal mine!). We couldn't get out of town fast enough. The best anecdote from this was when we couldn't decide whether to open the window in our hotel room to try and air out the heavy cigarette smoke smell or keep it closed to try and keep out the coal dust. Our next stop was the town of Pingyao. Surrounded by a completely intact 6km Ming dynasty city wall, it was an example of a well-preserved traditional Han Chinese city. For people who had limited time and wanted a slice of history it would be a perfectly fine place to go. For me though it was full of unappealing tourist restaurants and stands selling "traditional" trinkets...basically another tourist trap. The one highlight was watching Becca become famous; she purchased a set of paper cuttings from an older lady the first day we were there (didn't say it was all junk). The next day we went back by and she wanted a picture with Becca. By that afternoon, Becca was a famous happy customer in a 8x11 photo next to the lady set up in the street. Good stuff. So there you go. A Cliff Notes version of two of our stops. If you want to learn more, check out the links or the pics when we get them up. More general thoughts on China to follow from yours truly down the road.